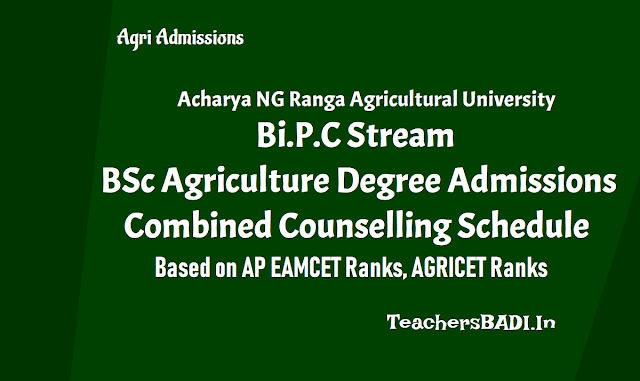 AP AGRICET BSc Degree Admissions Counselling Schedule based on AP EAMCET 2018 Ranks and AGRICET 2018 Ranks, ANGRAU BSc Agriculture Degree Admissions Counselling Schedule 2018, Combined couseling for UG Degree courses and AP AGRICET -2018 Ranks, Application for admission into B.Sc. 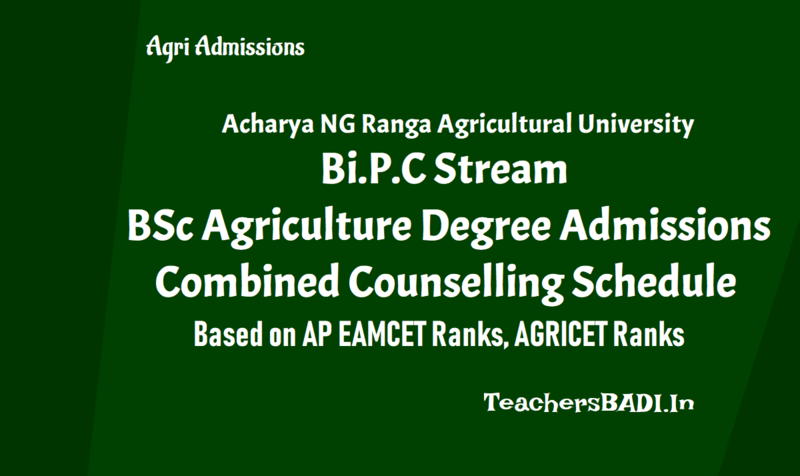 (Hons) Agriculture Course for the Academic Year 2018-19: Acharya NG Ranga Agricultural University has released the AGRICET BSc Degree course admissions Counselling Schedule for candidates who passed the Agricet-2018. Counseling will be held at LAM Farm Auditorium near Regional Agricultural Research Station at Guntur at 9 am on September 29th. Counseling will be held for 160 seats in all 5 Agirucultutal colleges and Private Agricultural colleges. Combined counseling for Physically Challenged (PH) and CAP quota candidates, applied online, for admission into Bi.P.C.Stream U.G. courses in ANGRAU, SVVU & Dr. YSRHU and Counseling for 20% supernumerary seats to Diploma Holders for admission into B.Sc. (Hons) Agriculture based on AGRICET 2018 ranks, will be held in the Auditorium, Regional Agricultural Research Station, Lam Farm, Guntur on the dates / times given below (including private Agricultural / Horticultural Colleges). Since the counseling for seats in private colleges is also clubbed with this counseling, more number of candidates than required are called for. Therefore, this call does not guarantee admission into courses to all those who have been called for. For complete details/fee particulars, candidates are advised to go through the University website: www.angrau.ac.in. before appearing for counseling. 1. All means all OC, BC’s, SC and ST categories as per the ranks indicated in the table. 2. For the Un-Reserved (Non-Local 15%) quota, any candidate from AU, SVU, OU/NL region with AP EAMCET 2018 Ranks and AP AGRICET 2018 Ranks respectively can compete on merit. 3. For the 85% local seats, the seats shall be allocated in 42 : 22 ratio in Andhra University and Sri Venkateswara University, respectively among the candidates in relation to the local area. 4. Combined counseling for candidates applied online under Physically Challenged (PH), CAP quota for admission into Bi.P.C.Stream Courses of B.Sc. (Hons) Agriculture / B.Tech. (Food Technology) / B.V.Sc.& A.H. / B.F.Sc. / B.Sc. (Hons) Horticulture Courses in ANGRAU, SVVU & Dr. YSRHU for the Academic Year 2018-19 is based on AP EAMCET 2018 Ranks and Counseling for 20% supernumerary seats to Diploma Holders (Agriculture/ Seed Technology/ Organic farming) for admission into B.Sc. (Hons) Agriculture is based on AGRICET 2018 Ranks. The seats shall be filled in as per the Presidential Order and Rule of Reservation. 5. Selection of candidates under S.C., S.T. and B.C. quota is subject to clearance by the respective social status Directorates of Government of Andhra Pradesh.The provisional selection under BC-E category is subject to the final adjudication (in W.P.No. 15267 of 2007) in the Hon’ble High Court of Andhra Pradesh. 6. The AGRICET 2018 Rank candidates are required to attend the counseling with duly filled in application form (downloaded from University website, www.angrau.ac.in along with original certificates and Demand Draft (original) for Rs.1300/- (Rs.650/- in case of SC / ST/ PH candidates) towards the application registration fee (Nonrefundable) drawn on any Nationalized Bank in favour of “COMPTROLLER, ANGRAU” payable at “GUNTUR”. The candidates are required to produce all the relevant original certificates at the time of counseling. The selected candidates have to submit all original certificates pay the requisite fee immediately (Rs.25,350/- for B.Sc. (Hons) Agriculture and B.Tech. (Food Technology) per semester in ANGRAU, for BVSc & AH Rs. 44,505/- per year and B.F.Sc. Rs. 30,120/- per semester in SVVU and for Rs. 31,990/- for B.Sc. (Hons) Horticulture per semester in Dr.YSRHU on the counseling day itself at the respective college counters, Hence the candidates need to come prepared. The candidates are required to pay either in cash or Demand Draft, the requisite total fee of Rs. 1,14,640/- (Rs. 98,640/- for first semester fee + Rs. 7,000/- Hostel & Mess deposit + Rs. 9,000/- Hostel Establishment charges) immediately on seat allotment. The Demand Draft shall be drawn in favour of “Comptroller, ANGRAU” payable at “Guntur”. Seat will be allotted only on payment of total fee. Since more number of candidates are called than the number of seats, the candidates may have to take back their cash, Demand Draft in case a seat is not allotted. ii) Those SC/ST candidates whose Parental / Guardian annual income is less than Rs. 2.00 lakh per annum are only eligible for fee re-imbursement and exempted from payment of tuition fee in Private Agricultural / Horticultural Colleges as per Govt. orders. a) Hence, those eligible candidates who are going to attend counseling need not pay the tuition fee of Rs. 52,100/- on allotment of seat in the counseling. All other fee of Rs. 62,540/- should be paid. b) Those eligible candidates are required to submit the Social Category Certificate and latest Certificate of Annual Income issued by “MEE SEVA” / (or) White Ration Card only. Any other certificate issued by other agencies will not be accepted. 8. Only one parent / guardian per student will be allowed at the counseling centre. 10. The pattern of education for B.V.Sc. & A.H. Course shall be annual system. 11. This notification shall be treated as individual intimation. No separate intimation will be sent. 12. The Counseling will be conducted on all the days as notified above including public holidays and even in the event of any day declared holiday by Government. 13. There is no sliding option. The seats falling vacant due to non-joining / cancellation of seats subsequently shall be filled up by open manual counseling only again,if necessary. 14. Only one parent / guardian per student will be allowed at the counseling centre. Since more number of candidates have been called, the counseling in the afternoon Sessions on every day is likely to be extended to late in the evening and night, till the counseling for the particular category is over. Hence the candidates and parents need to come prepared.